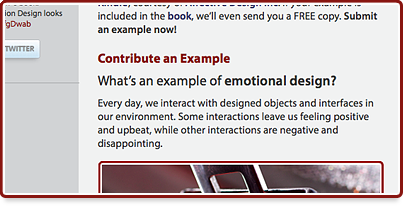 For the past several months, we’ve been accepting contributions for possible inclusion in “Design for Emotion”. But time is running out. It’s easy to submit an example. Just visit the Contribute page and fill out the form. We’ve received dozens of contributions from individuals, organizations and respected design firms all over the world. Every contribution is entered in a draw for an Amazon Kindle and if we use your example in the book, we’ll even send you a copy FREE. But, we can’t keep taking contributions forever, so we’ll be closing the window of opportunity very soon. It only takes a minute to submit an example, but your ideas may live in print for a lifetime.